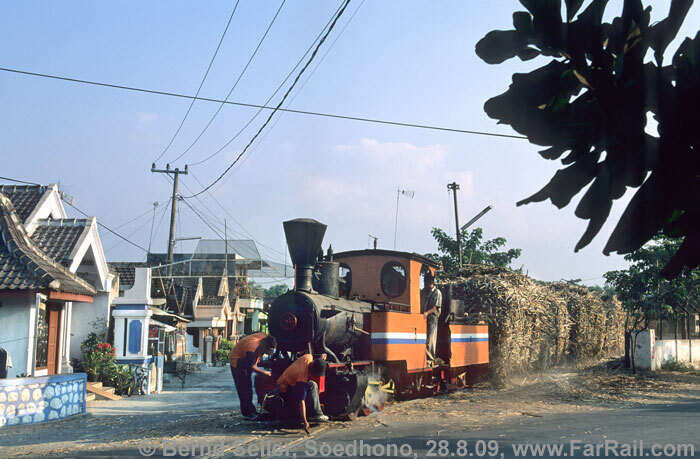 Almost a century old and a few even older, German, Dutch and Belgian steam locomotives are still in extremely hard daily use in the sugar mills of Indonesia. They need to earn their daily bagasse, water and oil with hard work in front of overloaded cane trains. 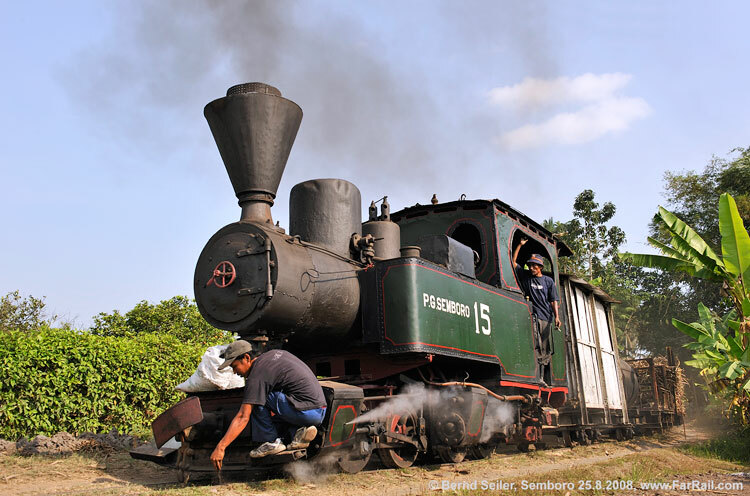 But, this living museum of steam is not the only reason to make Indonesia worth a visit. Feel the even beat of lots of ancient stationary steam engines inside the mills, some of which have been working for more than 120 years. Experience their vibration, their warm breath while driving giant flywheels and moving the cane crushers and, sometimes via transmission, other ancient machinery in the mills. 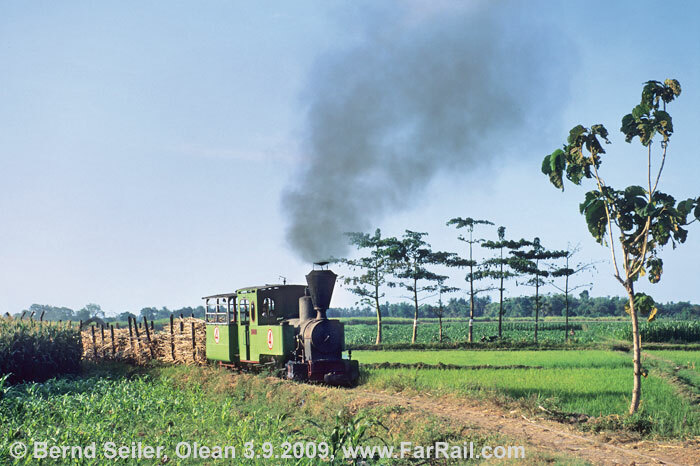 Less than a handful of mills still use steam locomotives on their remaining lines in the cane fields. 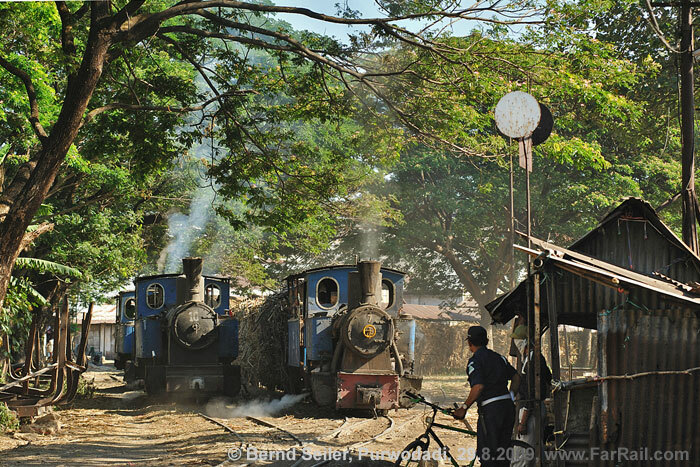 To get some authentic photographs and videos from a bygone era we’ll arrange some steam trains in the fields of Pangka and Semboro. We can travel on these trains and arrange some additional stops and runpasts to get the maximum of good pictures. We won’t add passenger coaches to these scheduled but usually diesel hauled trains, only authentic wagons are suitable. This is not so comfortable for us but it’s the only way to get serious shots on lines which do not usually see regular steam hauled trains. In addition we offer a number of steam charters on Cape gauge. We’ll see steam trains with different state railway locomotives and the forestry line in Cepu. 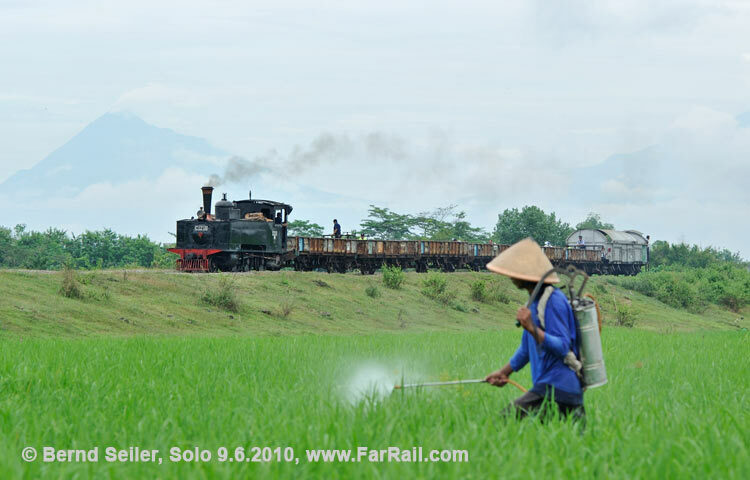 In Ambarawa we’ve planned a charter train on the very scenic line, which is partly a rack railway. Near Solo we’ll charter the centenarian C12 18, a 2-6-0 tank locomotive from Hartmann. We’ve ordered an authentic freight train on one of the last still existing branch lines of the state railway. Our visit to Mount Bromo will give us the chance to enjoy a fantastic view over two active volcanoes, including the highest one on Java: Mount Semeru. If we’re lucky, the latter spits ash clouds high into the sky at frequent intervals. 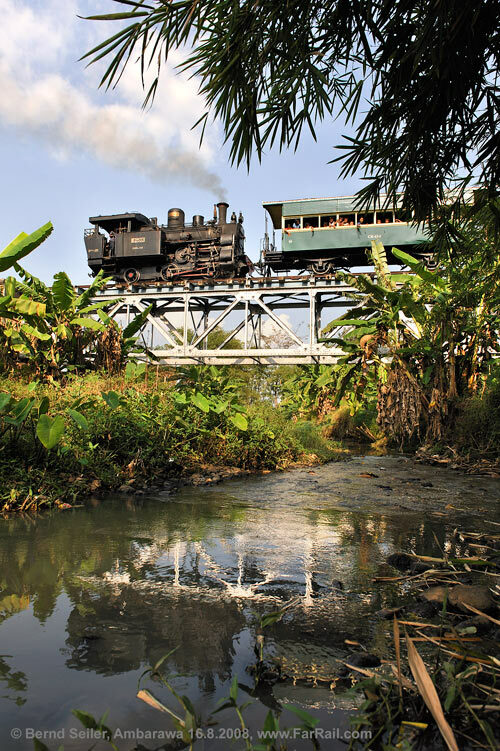 We can see Mount Semeru from a sugar railway line too, forming a spectacular backdrop for one of our steam trains. In the morning we’ll go by express train 10014 ARGOMURIA2 (air-conditioned) from Gambir (07.30 hrs) to Tegal (11.15 hrs). We’ll start our tour in Pangka. 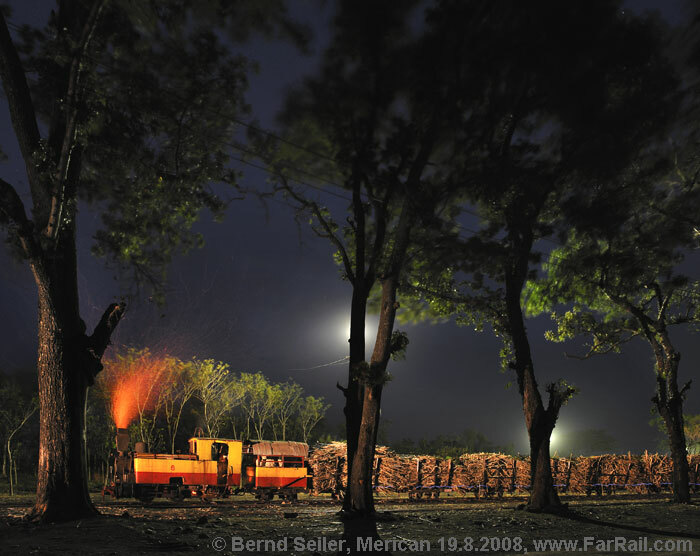 We start with a chartered locomotive in the cane fields to pick up a loaded train. Instead of a little diesel one of the beautiful 0-6-2s will haul the train to the sugar mills. Several stops and runpasts are planned along the line. In the evening we’ll make some night shots in the depot. Our hotel in Tegal offers a swimming pool. In the morning we’ll again visit Pangka to see the usual hard shunting operation between the two yards. A visit to the sugar mill with all their stationary steam engines is planned as well. Around noon we’ll continue to Sumberharjo. 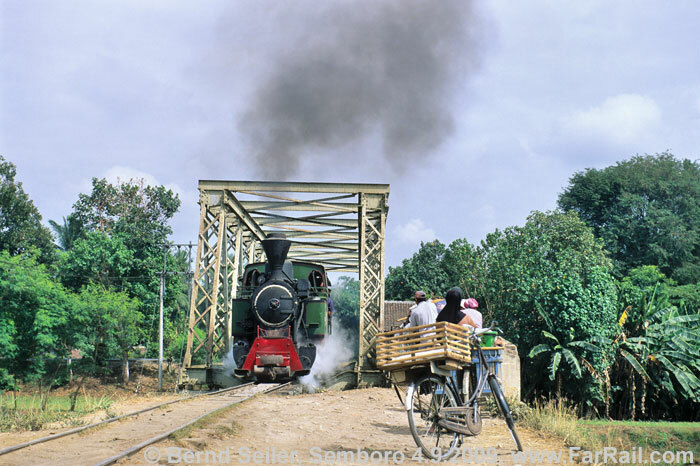 Sumberharjo is among the last mills to use steam locos for line service. Unfortunately, most of the loaded trains run shortly before or after sunset. We’ll contact the central control office to find out which steam train will be ready to start before sunset. Sometimes trains running during daylight, all you need is luck. In the evening we’ll return to our hotel in Tegal. In the morning we’ll visit the mill in Sragi. Besides up to seven steam locos Sragi uses a few diesels as well. 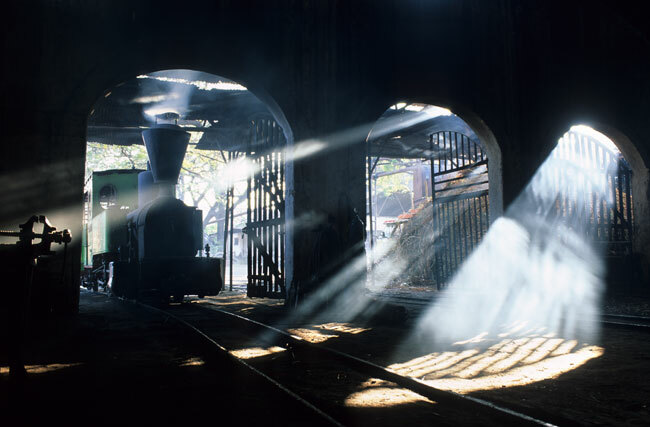 The morning light offers the best conditions for photography in the depot. Heavy trains are pushed from the large loading area in the mill’s yard. Often two locomotives are necessary to do this hard job! Such a spectacle can bring together locomotives from Hartmann, Schwartzkopff (0-10-0s) and Henschel. We expect to find five or six steam locos in service. 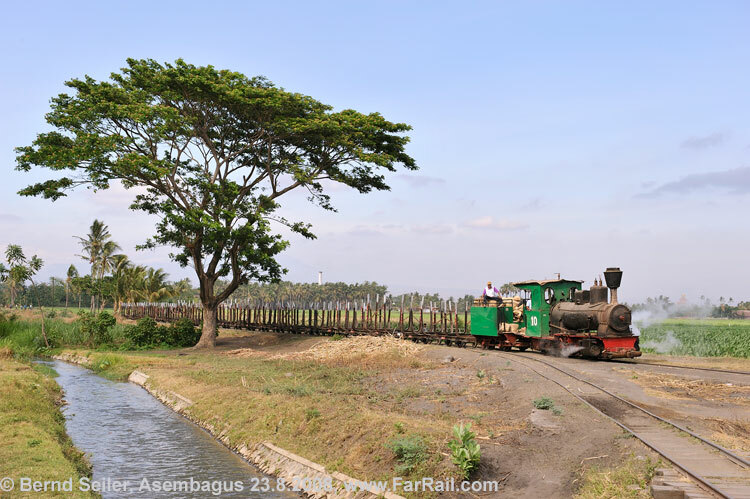 In the afternoon we’ll enjoy the rack railway of Ambarawa, where we’ve hired a train with the small class B25 rack loco. After dawn we’ll continue to our hotel near Solo. In the morning we’ll enjoy a charter freight train with the, more than a century old, 2-6-0T C12 18. Our train will run on a short section of one of the last operational branch lines of the state railway between Solo and Wonogiri. After lunch we’ll continue to Soedhono. After a long break the management have decided to use steam from 2009 again. The first locomotive in use is one of the beautiful inside frame 0-6-0 tender locomotives. They want to add a second loco in 2011. In the evening we’ll continue to Cepu where we’ll stay in the guesthouse of the forestry line. Before sunrise we’ll go to Purwodadi where all trains have to pass over a photogenic girder bridge between the loading point and the yard. Steam and diesel locomotives share the work. Almost all trains are banked and offer good photographic potential. In the morning we’ll make a brief visit to Kanigoro, where in 2007 only one locomotive was left in service. The blue locomotive is used in the yard with beautiful, large trees and, sometimes to bring trains over the weigh bridge. Just around the corner is the sugar mill Pagottan where we’ll probably see the last active inside framed Luttermöller locomotives in the world. Of special interest is the level crossing where it might be possible to get a locomotive and a horse cart together in the same picture. In the morning we’ll make another brief visit to Merican before we continue. In the late morning we’ll go on to the famous Gunung (mountain) Bromo, an active volcano which offers spectacular views to other volcanoes. The last time Bromo erupted was in 2004. Hotel in Ngadisari, the last village before the edge of the crater. Nights can be fresh here, you may need a jumper. If you’re going to Java you should not miss the spectacular view of Mount Bromo at sunrise. To experience this we have to get up very early. We will climb to the view point at the top of the volcano for the best view. You can also hire a seat in a 4WD Jeep for some 9 Pounds to avoid a walk of about 500 yards upwards and two miles in length. In the afternoon we’ll continue to our hotel in Situbondo. The full day is reserved for Asembagus with their interesting field work which is one of the last two mills left with frequent daylight steam into the fields. The lines are framed by palm trees and volcanoes forming interesting backdrops. Together with some little bridges there are plenty of photographic opportunities. However, there is no “steam guarantee” here either. Late afternoon we’ll return to our hotel in Semboro. Another day where we’ll take the chance to see a steam hauled train on the network of Olean. In the late afternoon we’ll continue to our hotel in Jember. For today we have planned two steam trains at Semboro. We booked the Jung loco for a morning train and the Mallet for an afternoon train. If they permit we won’t use the tourist coaches, we’ll haul real trains which we’ll take over from the diesel locos. Semboro still has a large active network and uses tiny German diesels or water buffaloes for pulling cane wagons out of the fields, while much stronger, boxy Japanese diesels haul the trains on the partly double track main lines. The huge system offers plenty of good opportunities for typical field operations. With some luck we can see the volcano Semeru and it would form an extraordinary background for one of our charter trains. The locos are both in a doubtful technical state. Failures my occur. In the evening we’ll go to our hotel next to the airport of Surabaya. Domestic flight to Jakarta (CGK). From there we’ll continue home. On the tour we will probably experience a Mallet locomotive as well as Luttermöllers or Klein-Lindner axle locos. 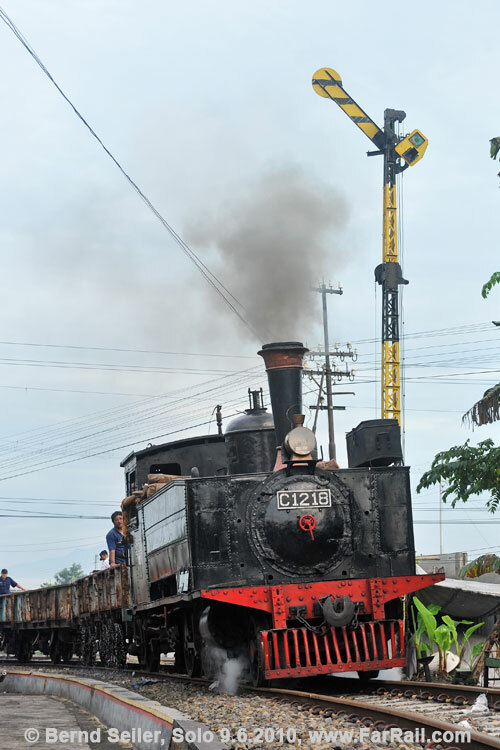 A special highlight is the geared locomotive built by Orenstein & Koppel in Rejosari. If still serviceable, we will hire it for an afternoon of shunting operations. While Orenstein & Koppel seem to be omnipresent on the island, other producers, mostly non-existent any more, are still part of the greatest narrow gauge steam show in the world: Decauville, Schwartzkopff, Maffei, Jung, Ducroo &Brauns, Hartmann and others. Our route may differ from the above itinerary in order to get as many good pictures of steam trains as possible. On the way, side trips to historical or other places of interest are possible. If agreed, the group may separate and meet together later. We will travel by charter bus. If you prefer a maximum of flexibility you can also travel in a chartered jeep. However, our bus has the advantage of a cool box to keep beverages chilly. Just let us know your preference when booking the trip. We will choose our hotels by their distance from the next steam mill, not only according to the offered standard. All our hotels offer air conditioning (exception: Mount Bromo, where temperatures can drop below 5°C (40°F) in the morning) and a private bath room, some offer a pool as well. European style toilets are not common in Indonesia. The chosen hotels will have a European style toilet but in small restaurants on the way or at railway stations for example you should expect Asian style lavatories. On many days we’ll get up early (around 6.00 am) and may even leave without breakfast sometimes. The best time for photography is the early morning between half past six and nine and the late afternoon between three and sunset around 17.45 hrs. The time in between is, because of the high sun, not rewarding for photography, even the dedicated video film maker wouldn’t be happy with the results during the noon time. You can enjoy a bath in the sea when we’re close to a beach. Because of the active volcanoes on the island the beaches offer black instead of white sand. The sea itself is quite polluted near the cities. The climate is tropical with high humidity and temperatures around 30 degrees Centigrade (90 Fahrenheit). Our jeeps/buses are fitted with air conditioning but you’ll do better if you acclimatise and accept the need to sweat a bit if you have to move quickly to get a photo. The electrical system is compatible with the European (230V/50Hz), but you need an adapter for the outlets, sometimes. Short trousers are a no-no because we’re travelling in an Islamic country. Short trousers are ok at the poolside of our hotels but not in the streets of cities and definitely not in the villages and sugar mills. In addition, you should avoid colourful clothes or highly visible colours because we’re on a tour for photographers and video film makers. If you get in the picture of others, it’s important that you’re not wearing clothes with intense colours. For the few mills with the best chances for line steam we have planned sufficient time. We haven’t planned to go to sugar mills with dumped steam locos only. Using the railways or any other kind of transport is at your own risk. Please check handles and foot steps before using them, they do not need to pass any safety check and can be very rusty or loose. 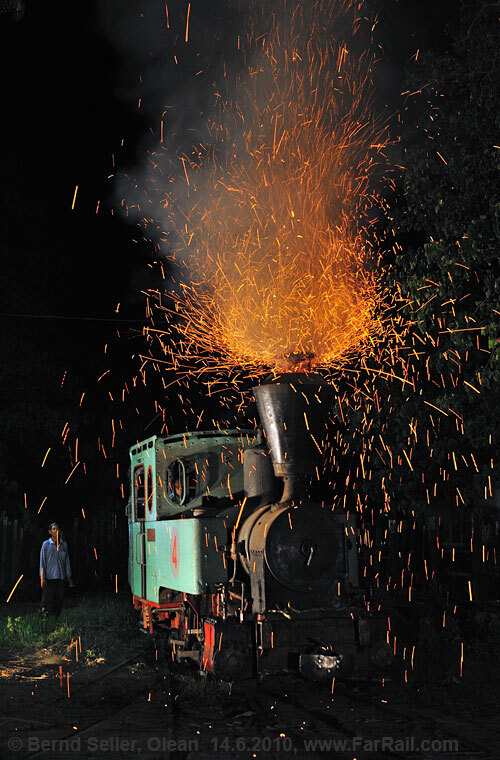 The locomotives produce a lot of sparks which may cause some burn holes in your clothes. Without international flight: please deduct £715 from the tour price.